Tue 23 Apr 2019. 4.00pm. Llangasty Retreat House, Llangasty Tal-y-llyn, Brecon LD3 7PX, UK. Residential Retreat. 23-28 Apr. Residential Retreats begin at 4pm on the first day and finish after lunch on the last day, unless otherwise specified. Booking essential. Wed 24 Apr 2019. 1.05pm. Beulah URC Church, 1A Beulah Rd, Cardiff CF14 6LT, UK. Lunchtime Recital. The Roberts Family: Elen (double bass), Hanna (viola), Catrin (saxophone), Emyr (piano). Tickets £5 on the door. Fri 26 Apr 2019. 1.00pm. National Museum of Wales. Organ Recital. Free. Places limited: book on arrival. Tue 30 Apr 2019. 10.00am. Llangasty Retreat House. Cader Idris Quiet Day. Thu 2 May 2019. 10.30am. Llangasty Retreat House. Quiet Day. Sat 4 May 2019. 7.30pm. Insole Court, Llandaff. Pavane Early Music Consort. Music from Court, Church and Opera stage. Thu 9 May 2019. 7.45pm. St Andrew's URC Church Hall. Roath Local History Society. Talk by Mike Collins: The family-owned businesses, that established Roath as Cardiff’s premier, suburban shopping area. Fri 10 May 2019. 1.15pm. St John the Baptist. Organ Recital. Sarah Baldock (Cheltenham Ladies’ College). Free; retiring collection. Sat 11 May 2019. 7.15pm. Hoddinott Hall. 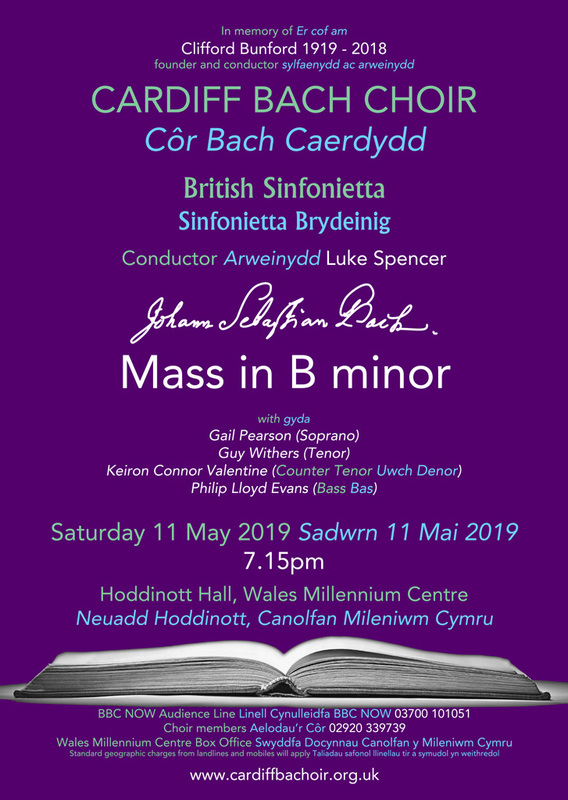 Cardiff Bach Choir. Poster. Mon 13 May 2019. 10.00am. Llangasty Retreat House. Drop-In Day. Tue 14 May 2019. 1.00pm. St David's Hall. Organ Recital. Paul Carr (Birmingham). Tickets £8 (conc. £6). Wed 15 May 2019. 7.30pm. Llandaff Cathedral, Cathedral Cl, Cardiff CF5 2LA, UK. Organ Recital. Thomas Moore (Wakefield Cathedral). Admission free; retiring collection. Wed 29 May 2019. 1.05pm. Beulah URC Church, 1A Beulah Rd, Cardiff CF14 6LT, UK. Lunchtime Recital. RWCMD students Mari Kelly & Elin Kerry (harp). Fri 31 May 2019. 1.00pm. National Museum of Wales. Organ Recital. Mon 3 Jun 2019. 10.00am. Llangasty Retreat House. Drop-In Day. Mon 10 Jun 2019. 4.00pm. Llangasty Retreat House, Llangasty Tal-y-llyn, Brecon LD3 7PX, UK. Residential Retreat. 10th-13th June. Residential Retreats begin at 4pm on the first day and finish after lunch on the last day, unless otherwise specified. Booking essential. Wed 12 Jun 2019. 7.30pm. Llandaff Cathedral, Cathedral Cl, Cardiff CF5 2LA, UK. Organ Recital. Stephen Moore. Admission free; retiring collection. Fri 14 Jun 2019. 1.15pm. St John the Baptist. Organ Recital. Elin Rees (Bury Parish Church, Lancashire). Free; retiring collection. Sat 15 Jun 2019. 11.00am. Llandaff Cathedral. RSCM Choral Festival. Wed 26 Jun 2019. 1.05pm. Beulah URC Church, 1A Beulah Rd, Cardiff CF14 6LT, UK. Lunchtime Recital. Laura Deignan (clarinet) & Sioned Evans (piano). Mon 1 Jul 2019. 10.00am. Llangasty Retreat House. Drop-In Day. Wed 3 Jul 2019. 7.30pm. Llandaff Cathedral, Cathedral Cl, Cardiff CF5 2LA, UK. Organ Recital. Jonathan Hope (Gloucester Cathedral). Admission free; retiring collection. Tue 9 Jul 2019. 7.30pm. St Edward's Vestry. Cytun Meeting. Fri 12 Jul 2019. 1.15pm. St John the Baptist. Organ Recital. Margaret Phillips (International Concert Organist). Free; retiring collection. Fri 19 Jul 2019. 4.00pm. Llangasty Retreat House, Llangasty Tal-y-llyn, Brecon LD3 7PX, UK. Residential Retreat. 19-21 July. Residential Retreats begin at 4pm on the first day and finish after lunch on the last day, unless otherwise specified. Booking essential. Tue 23 Jul 2019. 10.00am. Llangasty Retreat House. Cader Idris Quiet Day. Mon 29 Jul 2019. 4.00pm. Llangasty Retreat House, Llangasty Tal-y-llyn, Brecon LD3 7PX, UK. Residential Retreat. 29 July - 1 Aug. Residential Retreats begin at 4pm on the first day and finish after lunch on the last day, unless otherwise specified. Booking essential. Sat 3 Aug 2019. 10.00am. Llangasty Retreat House. Quiet Day. Mon 5 Aug 2019. 10.00am. Llangasty Retreat House. Drop-In Day. Tue 6 Aug 2019. 4.00pm. Llangasty Retreat House, Llangasty Tal-y-llyn, Brecon LD3 7PX, UK. Residential Retreat. 6-13 Aug. Residential Retreats begin at 4pm on the first day and finish after lunch on the last day, unless otherwise specified. Booking essential. Fri 9 Aug 2019. 1.15pm. St John the Baptist. Organ Recital. Iain Simcock (International Concert Organist). Free; retiring collection.